Austin has one international airport, Bergstrom (airport code AUS). It’s a relatively small airport though, and many flights go through the two larger hubs in Texas, Houston (IAH) and Dallas Fort Worth (DFW). Texas is home to Southwest airlines, the world’s largest low-cost carrier, so there are plenty of domestic flights to the city on Grand Prix weekend. Downtown Austin and the University of Texas campus area are very walkable and well serviced by the Capital Metro Austin public transit system. Circuit of the Americas (COTA) is located 15 miles (24 km) from downtown Austin. The best way to get to the track is by car (your own, a hire car or taxi) or the COTA shuttle. When making plans, be aware that Austin traffic is notorious most times of the year, but especially during major events such as F1. Getting to the track from downtown can take up to two hours! Plan accordingly and don’t forget to purchase parking passes for the track if you do take your own vehicle. The cheapest European flights land in Houston (IAH) or Dallas (DFW), depending on the airline. The only direct European connection to Austin is with British Airways from London. Examples fares: London–Austin via LAX with American Airlines from £650, Paris – Austin from €850 with American Airlines via Dallas, Berlin – Austin with United via Newark from €800. All flights from Australia have at least one layover on the way, though United offers the quickest connection between Sydney and Austin. Including a stop in LAX, the flight time is 19-22 hours and return fares start at $1200 AUD. Other airlines that fly from Sydney or Melbourne include Qantas, Delta, Virgin Australia and American Airlines. There are no direct flights to Austin from Asia, South America or Africa. Most flights route via major hubs such as LA, Atlanta, New York, Chicago or Houston. The following airlines offer direct flights to Houston (IAH): from Moscow with Singapore Airlines / from Dubai with Emirates / from Rio de Janeiro or Tokyo with United / from Beijing with Air China. All of the major US airlines service Austin, though many connect first in a bigger Texas city. 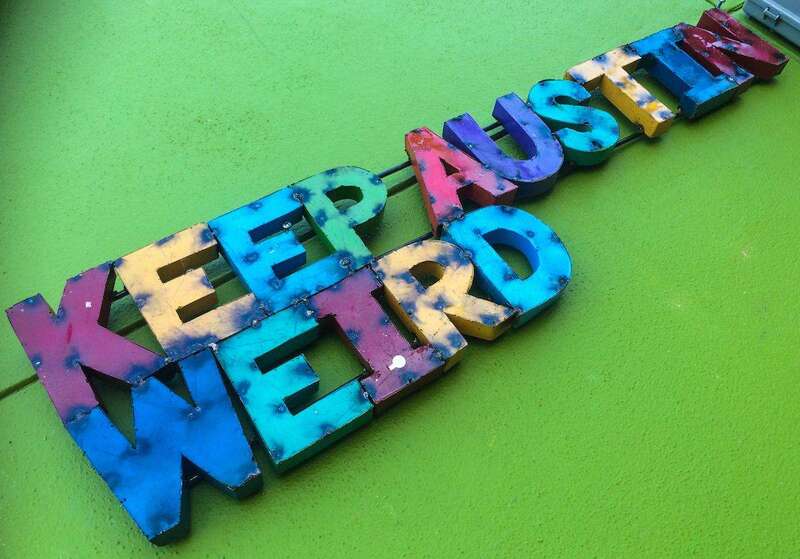 Air Canada, American Airlines, Delta, Southwest, United and Alaska Airlines will all get you to Austin. Example fares: New York–Austin (non-stop with Southwest in 4 hours from $300 USD), LA–Austin (1 stop with Delta in about 5 hours from $250-300 USD), Toronto – Austin (non-stop with Air Canada in 3 hours 20 min for about $600 USD. Another option for getting to Austin is by car. The U.S. has a large interstate highway system, and you can drive to the city from Houston in 2.5 hours, Dallas in 3 hours, or San Antonio in 1 hour. Why not hire a car and explore the region? Buses and trains are also available for budget-conscious fans. Click here for a detail interstate highway map. Rent a car from our partners Rentalcars. 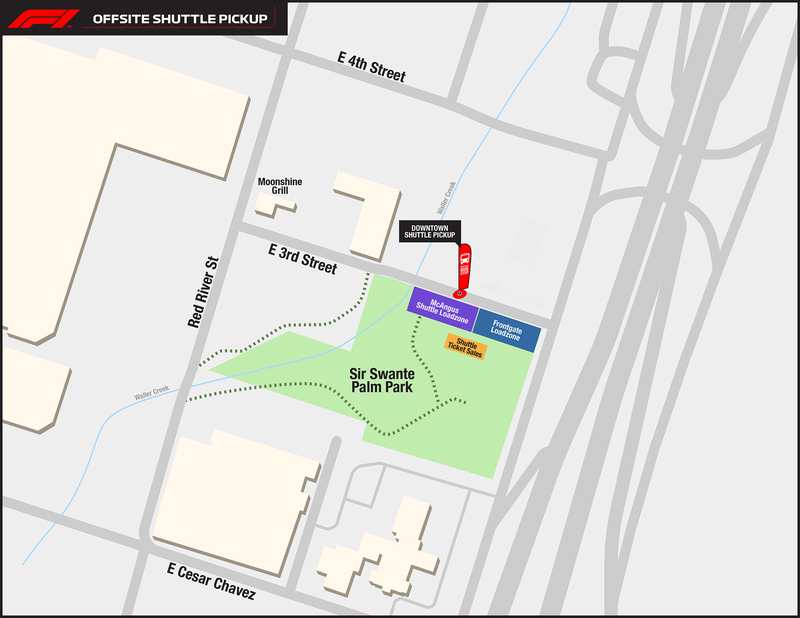 Shuttle: if you’re staying downtown, the COTA shuttle service is the best way to get to the track. Shuttles departs from the Austin Convention Center (check map) and cost $15 return when bought online or $20 from the driver. You’ll get dropped off at the McAngus stop near the circuit, 15 minutes walk from the main entrance. For those who are unable to walk that far, another shuttle does drop you at the main entrance, but it costs $45 return. Shuttles operate from 07:00-19:00 on Friday, 07:00-midnight on Saturday and 07:00-22:00 on Sunday . Be aware that shuttle buses are as liable to get stuck in traffic as cars, so a one-way trip can take up to 2 hours at peak times. Click here for more information on 2018 US Grand Prix shuttles and to buy advance tickets. Drive: despite the prevalence of public transportation Austin offers compared to other Texas cities, it is still very much a town built for cars, and the best way to get around is to drive. The Circuit of the Americas is located off the SH130 toll road, which you can access from downtown by taking I-35 south to highway 71 east. There are four main parking areas next to the track and a ‘park and ride’ service is also available. Taxis and ride sharing services such as Uber are worth considering (more below), though it’s a good idea to arrange your return trip from the circuit in advance to avoid delays. 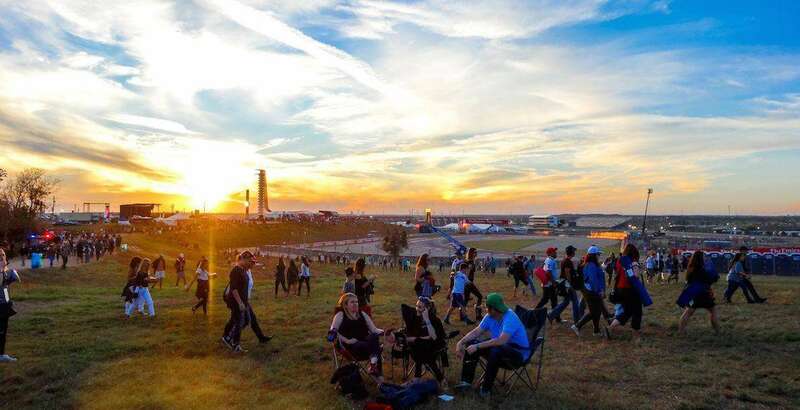 Click here for COTA parking and entrance maps. Buses: Capital Metro, the city’s public transportation authority, offers a MetroAirport bus that runs regularly from the city to the airport. To check its route and schedule, visit the Capital Metro Airport page. A ticket costs $1.75 USD and can be bought with exact change on board or using the Capital Metro app. Shuttles: the highly-rated SuperShuttle service offers shared vans, non-stop vans and even private sedan and SUV services, depending on your budget. Reserve your trip on their website and a shuttle will be waiting to take you to your hotel or apartment when you land. Prices from $12 each way. In addition to the dozens of bus lines servicing most of the city, Capital Metro also operates one city train line called MetroRail. MetroRail runs Monday through Friday between Leander and downtown Austin, and from Lakeline to downtown on Saturday. See the Capital Metro website for routes and schedules. There are plenty of taxis in Austin. Downtown, your best bet is to get one from a hotel taxi stand (or call, for example Yellow Cab, tel: 512-452-999, who also have a handy fare calculator.) Getting to COTA from downtown in a taxi should set you back around $50. Ride sharing sites Uber and Lyft are also worth considering: a ban on them operating in Austin was lifted earlier this year. If you’re staying downtown, most attractions the city has to offer are within walking distance, but you can save time and see more by renting a B-cycle bike. Austin B-cycle has dozens of stations all around the city where you can pick up or drop off a bike, and rides under 30 minutes are free after you pay the initial service fee of $8 per day or $11 per month. 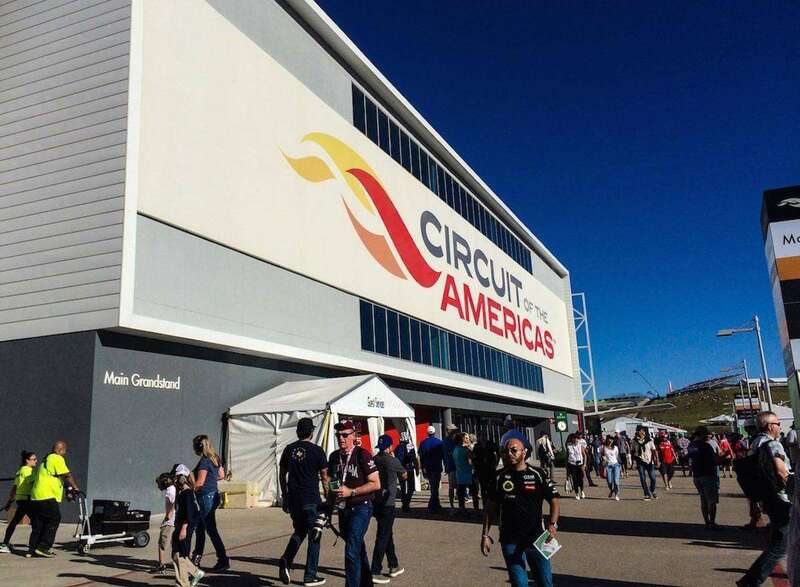 Have you been to Circuit of the Americas? Leave a comment with your travel tips below! Hi Carrie, details for this year haven’t been announced. However, last year three shuttle services were offered (no stops along the way). Options 2 and 3 were only for Saturday and Sunday. It looks like option 3 is best for your location. More details should be available closer to the race weekend. Hello… I took the Travis Co. Expo location shuttle last year (2016). This year I’m again staying near the Arboretum, but I haven’t found any shuttle info on that location for 2017.
will it be available, if someone has info or a link please share. Hi Mario, we are pretty sure this will be available again this year, but you will need to wait until a bit closer to the event for details. As soon as we have information, we will update this page. Thanks! Hi, thank you very much for all the info on shuttles. In your opinion, is it better to take the shuttle than drive and park? Also, how often do shuttles depart? Also, I have not found any tickets available online. Is it easy to find a space on these shuttles? Hi Alejandro, shuttle information for 2017 has been published on the COTA website, including links to buy. I’ll be in town for a conference so will only be able to make it race day, but what a great bit of luck. The conference is at the J.W Marriott Downtown. If I’m looking at taking the shuttle, how early do you recommend I try and get there to avoid traffic/access problems? Hi Dean, it depends if you want to catch the support races on Sunday morning or not. Gates open at 9am, and plenty of people will be getting there early (especially those in General Admission, without a grandstand seat). Ironically, you may be better off going a bit later after the initial crowds have died down. Hi Andrew. I will be travelling in from San Marcos and want to know what are the best options for the four of us. Official parking at COTA for only Sunday is unavailable, and I’d rather not purchase a 3-day pass to only make use of it on Sunday. 1) Is there any transportation into COTA that isn’t by car, or shuttles that don’t originate from downtown Austin? 2) These park-n-rides mentioned – where are they, what are their names? 3) Unofficial parking lots nearby – what exactly does this mean? 4) Any public transportation available to take to COTA from an area southwest of the track? 5) Are taxi’s at all reliable for an event like this? I assume it would be dicey getting one back to wherever we had parked. Hi JC, I don’t know the answers to all your questions, but I will answer those I can (maybe someone else will help with the others!). 1) There are shuttles that don’t originate in downtown. See my earlier comment above on July 17 this year. 2) Park & Ride info is in Trackside section of our guide. Thanks for the info on my question. In regards to Uber/Lyft, I believe they are still banned in Austin but there is a plan to remove the ban. Don’t know when (if) that is happening. If you get there and find it is not available, Austin has another ride share service called “Fasten” that is basically the same thing. Hi Dean, here’s some up to date discussion; looks like ride sharing is back on in Austin! Also looks like shuttle is a much better option than park and ride due to local traffic, especially at peak times. Any idea how long it will take after the race to get to the airport. I see it’s 9 miles away but know traffic will be heavy. Just trying to see if I’ll make my 6:30 flight? It’s not too far from COTA to the airport as you know, but I would really consider changing your flight. The traffic after the race is really bad and it could take anywhere from 1-2 hours to get to the airport. You’ll be stressed the whole day rather than enjoying the race! I wouldn’t fly out before 8pm at the earliest. I cannot find a link to prepurchase shuttle tickets at the COTA website. Anyone else had more luck? Hi Sean, details not yet announced for 2017. Check the COTA website a bit closer to race weekend for details. Does anyone know how far the McAngus lot is to the Grand Plaza? COTA have announced the shuttle times and prices but the difference in pricing between them is very high so if I can walk on the dedicated path from McAngus, I’ll be taking the cheap option! But would want to know how far I have to walk first! Have emailed the circuit to ask but if anyone on here can help me quicker, I’ll know which tickets to order! Thanks! Hi Diane, I believe it’s about a 15 minute walk. I’d be taking the risk to save a few dollars! Anybody staying at Towneplace suites-austin-north-tech-ridge by any chance and want to share a taxi/uber to the racetrack? We are in Houston for business on Monday and plan to drive to Austin for Sunday’s F1 race. Track parkings are full, and driving downtown first to catch a shuttle seems inefficient. I read that there’s a shuttle from the expo center for 15$, and parking there is free. How big is the risk of us going there and find a full lot? What method of transportstion could we best use? Hi Jacob, I’m not sure if the Expo Center parking lot will fill up or not. Another option is to park somewhere else and take an Uber to the track. We got the track tickets, and we’ll gladly take your advice for the Uber. It’s our first trip to COTA and our parking says we are in Lot L. Looking at maps on website, I see no indication on best route to take to get to Lot L. I am coming from Seguin TX Sunday morning for the race. Any advice on best routes ?? There’s a map with directions on coming in to Lot L here. Hi! I’ve been trying to find out how often the bus picks people up from the Austin convention center? The website only says the bus runs from am to midnight, but nothing about the intervals. I reach Austin in 12 hours, so any help will be greatly appreciated. I am planning to be seated at the Turn 1 general Admission area. Whats the best way to get there? I don’t mind spending the $50 for the shuttle to get to the front area. Once there how do i get to the different parts of the circuit? Hi Ajay, check the detailed map here. Easiest way is to just walk from one part of the circuit to another, there are plenty of signs. But isn’t walking from the Grand Plaza to Turn 1 a good couple of miles? Wouldnt there be Shuttles available inside the circuit to get from point A to B? Can I just drop my son off at Lot L? We went to JT last night and waited till 12:30am to get the bus back to Lot Q.
I would like to avoid that chaos tonight. Hi, will we make our flight out after the GP has finished at 6:44pm from Austin Airport? First time at COTA will be for the MOTOGP … I have been reading about problems with mud and parking. Are any of the lots cement or asphalt? Which is a better lot T or N? Is there is limit on vehicle size in the parking lots? We are driving our 24ft Rv down and want to park on sight each day if allowed? The Rv sites are all booked but we found an Rv park nearby. Also, what time do we need to be out of the lots each night? How long is the walk from the Downtown drop off at McAgnus to front gate? Is there an Arboretum Shuttle? Are there any shuttle buses from south of Austin to COTA? E.g. Kyle, Mtn City, Buda, etc. . . or only from downtown Austin to COTA? 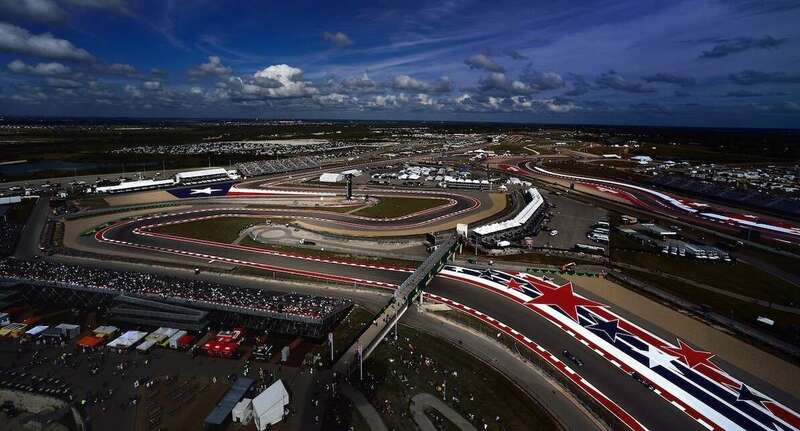 Hi, please advise when details of shuttle services will be available and also ticket prices for the 2019 US Grand Prix? Hi Liz, tickets don’t normally go on sale until March or April. Details of shuttles won’t be published until 1-2 months before the race.